St John the Baptist VA Primary School: Working Together to Achieve Our Best, in a Caring Christian School. Working Together to Achieve Our Best, in a Caring Christian School. 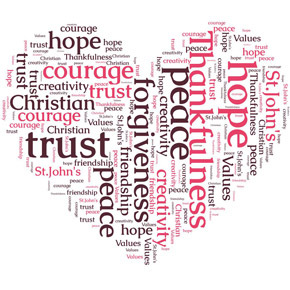 Friendship, trust, forgiveness, courage, creativity, peace, hope and thankfulness. Teachers, governors and parents all work together in partnership with one common aim: to do the best we can do for our children. We strive to create an environment where pupils are securely challenged, supported and feel confident. Each child is valued equally and we believe that each child should be motivated to reach his or her potential, in order to take their place as a good citizen within the community. We hope that you enjoy our website and find it informative. If you would like to know more about us or would like to arrange a visit, please do not hesitate to contact the school. We look forward to hearing from you. Class 4 Egg Rolling Championship.